Companies looking to monetize their content with online subscription models would be advised to look for additional sources of revenue according to results from the Q3 edition of Digital Life Canada, SRG’s quarterly trend survey. The research benchmarked consumers’ willingness to pay for various types of content online. Only 14% would pay for newspapers online; TV shows did better at 22%, and books seemed worthy of payment to 29%. Movies had the most potential, with 37% indicating willingness to pay. Currently paying for online or mobile content is the domain of a minority, the research found. 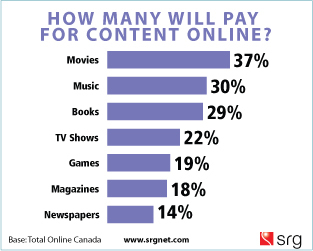 Only 11% of online Canadians actually paid for content online or on mobile in the past month. Even among those who use iTunes or own a smartphone such as an iPhone, only one-in-five paid for content (or an ‘app’) in the past month. Many consumers believe that they already are ‘paying’ for content and services through their Internet or mobile subscription fees and they say that the “ability to find things that are free without additional fees is one of the great things about the Internet” (77% agree). Christmas in High Definition. A flat-screen HD set is only second to ‘clothes’ on Xmas wishlists this year. And among Canadians 30-49, it’s the number one item of desire. With HD set penetration now at 44%, this suggests that we will break the 50% mark by January. Holiday wishlists are a mixed bag this year, with clothes, HD sets, a new car, a digital camera and an iPod in the top five. Online TV is Up Again—VoD Not. Online video and TV content continues to trend up. We’ve seen the percentage of online Canadians reporting watching TV episodes online double between Q4 2006 and Q3 2009. And they are generally happy with the video viewing experience. On the other hand, digital cable Video-on-Demand stayed flat with minimal sign of momentum. Social Web Becomes a Content Sharing Platform, Including Video. Twitter doubled in audience size in less than a year in Canada. Facebook is flat but our research finds that users continue to remain engaged with the platform. Among the most popular activities social web is video: 38% of Facebook users clicked on a video link in the last week, while 30% of Twitter users did the same. In other words, an estimated 6 million Canadians watched video via a social website in the last week. “Most Improved” Companies in Communications include Shaw, Rogers, Videotron and Bell Aliant. On a top-of-mind basis, Shaw took the top spot in the West over Telus. In Ontario, the top spot went to Rogers over Bell. In Quebec, Videotron was #1 while Bell Aliant took the top honours beating Eastlink in Atlantic Canada.